The egg-dart self- contained two-tier fountain on the left is the definition of elegance! This fountain complements any landscape with its intricate acanthus carvings on the pedestal and base. 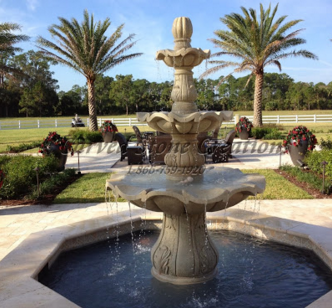 Another two-tier fountain style is the mermaid fountain with a classical dolphin pedestal. This fountain is a tribute to the sea, and includes two mermaids with clam shell bowls. It is sure to bring unique beauty into your home with a mystical feel. You can never go wrong with a classic! This classical three-tier fountain pictured on the left is handcarved from Giallo Fantasia granite and gives a tropical feel with the pineapple resting on the top. The bubbling water gently flows down this fountain, leaving you feeling at peace. Another three-tier fountain option is the three-tier scalloped fountain. It is handcarved from Golden Cypress granite with stunning carvings on the rim of the fountain bowls. Making a grand statement in your garden just got a lot easier! The fountain pictured on the left is the four-tier acanthus fountain, which is featured in Giallo Fantasia Dark granite. This fountain features acanthus leaf carved details and a petal-like detail around the basins. The elaborate design highlights any garden or landscape feature and serves as a striking centerpoint. Another unique design is the tall four-tier fountain handcarved from our Giallo Fantasia R granite. This masterpiece includes classic scroll work carvings. It is paired with a 12 diameter fountain pool surround and also features a spray ring that creates a waterfall look that is one of a kind. If you see a tiered fountain that has caught your eye, contact us today! Sign up for our free Photoshop Presentation to see your dream fountain in your landscape. Simply send us a photo of your home or garden, then tell us your favorite fountain and we will put the two together for you!